Ambassador David Friedman calls Obama administration the 'dark days' for Israel, says President Trump 'treats Israel like an ally'. US Ambassador to Israel David Friedman lauded the Trump administration and its handling of the US-Israel relationship, while slamming President Obama over his administration’s tacit support for an anti-Israel resolution passed by the United Nations Security Council. 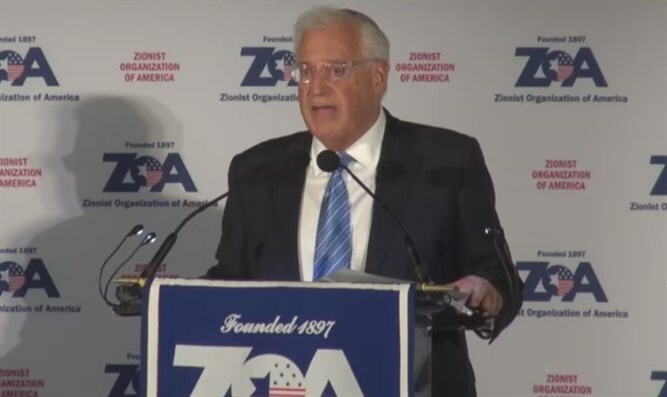 Ambassador Friedman spoke Sunday evening at the Zionist Organization of America’s annual gala in New York City, along with former White House chief strategist Steve Bannon, casino mogul and philanthropist Sheldon Adelson, Senator Tom Cotton (Arkansas-R), former Senator Joseph Lieberman, and ZOA chief Morton Klein. “Imagine, a resolution stating that the Western Wall is illegally occupied territory. And unthinkably, the United States abstained and permitted that resolution to pass. And a day later, the Secretary of State's attempts to justify this outrage only compounded the problem and revealed a stunning rejection of America's most important Middle Eastern ally." Friedman blasted the Obama administration’s behavior in the lame-duck period from last November through till inauguration day on January 20th as the “dark days”. "I hope you agree with me that we have turned a page since the dark days of last December. Gone are the days when the United Nations bashes Israel with impunity." "In Ambassador Nikki Haley [US Ambassador to the UN], there is truly a new sheriff in town down the block in Turtle Bay [neighborhood of Manhattan, where the UN headquarters are located]." The ambassador noted that President Trump had made history by becoming the first sitting US president to visit the Western Wall, and claimed that the president would make good on his campaign pledge to relocate the US embassy from Tel Aviv to Israel’s capital. "But that's not the only stark change for the better in the Trump administration. In May of this past year, there were two firsts that you may have noticed. Earlier that month, I had the privilege to be the Mast of Ceremonies at the very first Yom Haatzmaut [Israeli Independence Day] celebration at the White House, hosted by Vice President Mike Pence. "Later that month, and far more striking, President Trump became the first sitting president to visit the Kotel Hamaaravi - the Western Wall - a visit that resonated across the Middle East. "Before President Trump arrived, I was the first United States ambassador in American history to attend a celebration of Yom Yerushalayim [Jerusalem Day], celebrating the reunification of Jerusalem. I think we're making progress. "The president recognizes the critical importance that Judea and Samaria never become another failed experiment, like we saw in the Gaza Strip. The president knows that Judea and Samaria are not situated next to Finland or Costa Rica. And perhaps most importantly, you will never hear the president make the case, as his predecessor did, that there is some symmetrical relationship between building a house in the Samarian village of Halamish, and the brutal of a father, a son, and a daughter in the town of Halamish at the Shabbat table. There is no equivalence whatsoever, none. "The president has also made clear that he intends to move the United States embassy from Tel Aviv to Jerusalem. It is not a question of if, it is a question of when. And I take the president at his word, and I'm personally committed to do all that I can to advocate for this move. "The United States government treats Israel as it deserves to be treated - as a critical, strategic, and trusted ally in one of the world's toughest neighborhoods."